timebymail ... watch and jewelry accessories Shop about us feedback People are saying that watch repairing is a dying trade, well let us help you find top quality horologist tools and accessories at trade prices. We specialize in supplying watch repair kits and accessories to the trade, we try our utmost to supply all the tools you'll need to repair your watch, from the budget starter packs to high quality Swiss tools. Other Products shop Leather Straps 16 to 30mm Omega Dynamic Straps Stainless Steel Straps Rubber/Silicone Straps Nylon Watch Straps Swatch Straps Watch Hands Other Watch Parts Wholesale Watch Straps Vintage Watches/Straps Watch Tools Watch Crystals Clock Parts and Tools Jewelry Tools and Display 4 Piece Replacement Gold Plated Crown and Stems Set A NEW set of 4 piece Stainless Steel crown and Stems for most brands of watches. There is 1X 6mm gold coloured crown and 3x 0.9mm Stems. 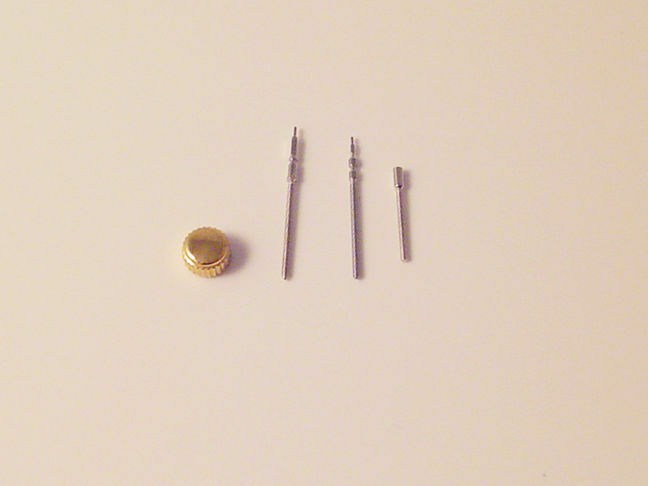 The first stem (left) is for ETA 2836/2824 movements. The next (middle) is for MIYOTA 2035 (065-468) movements. And the last stem (right) can be used as an extension or on some quartz movements. Please see below pictures and crown stem dimensions. A great set and a must buy for all horologists. We have many more sizes and colours in our shop. Condition - NEW Quantity - 4 Pieces Colour / Material - Gold / Stainless Steel Crown Size - 6mm Crown Type - 0.9mm Flat Style (see pictures) ETA Stem - 1X 2836/2824 16mm long / 0.9mm MIYOTA Stem -1X 2035 (065-468): 18mm long / 0.9mm Quartz/Extension Stem - 1X 12mm long / 0.9mm We would be grateful if you could confirm your address as soon as possible after payment is made. We are truly sorry for any inconvenience this may cause but unfortunately Paypal are giving some addresses as "Not Verified".